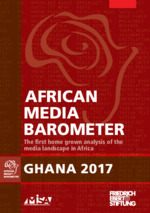 In spite of deficits in democracy and widespread corruption, Ghana has been on a politically stable trajectory since the launch of political reforms in 1991/92. Free and fair elections have been carried out on a regular basis since 1992. Both elections as well as changes in government have been peaceful so far. This development stands in stark contrast to developments in the rest of West Africa, which have been marked by coup d’états, violent conflict and political violence. Ghana's political development has until recently been buttressed by strong economic development, one-sidedly fueled by revenue from natural resources. Plummeting international oil and gold prices have removed considerable momentum from Ghana's economic upswing, however. In 2014 the government approached the International Monetary Fund (IMF) seeking support for a reduction in the government debt. At the same time, unequal distribution of revenue has been on the rise, with only a small elite profiting from the country's new prosperity. In statistical terms, poverty is decreasing, but a majority of the population continues to live in poverty. To be able to continue on its successful path from the past once again, the Friedrich-Ebert-Stiftung (FES) is working to have greater controls exercised on the executive branch. It is to this end that the FES is cooperating with the Parliament and supporting political participation by young adults and women. The Social Democratic dialogue that the FES is carrying on with the opposition party - the National Democratic Congress (NDC) - is also intended to contribute to this. One of the main challenges in the future will be development of a sustainable and social economy that is in a position to raise broad strata of the population out of poverty. Closely associated with this is transparent use of revenue from natural resources. It is with this in mind that the FES is working with ministries, trade unions and civil society organisations on concepts for structural transformation of the Ghanaian economy. 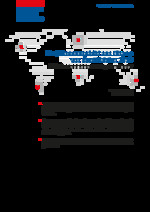 The FES furthermore works with partners on the ground in the area of security policy. The FES has been in Ghana since 1969. It left the country in 1981 in the wake of a military coup d’état, only returning in 1988. 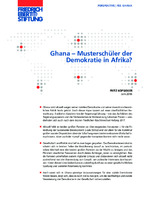 Ghana - Musterschüler der Demokratie in Afrika? bleibt das Land Afrikas Vorzeigedemokratie?